Smart IOPS Data Engine solid state drives (SSDs) are the new category of enterprise PCIe NVMe SSDs that offer supercharged performance engineered to remove the storage bottleneck in High Performance Computing (HPC) and high-end enterprise data centers. With its unprecedented (1.7 million IOPS and 6.8GB/s in bandwidth) Data Engine SSDs deliver 4x the I/O processing bandwidth of competing high-end PCIe NVMe enterprise SSDs with ultra -low latency, eliminating performance bottle-necks and significantly improving QoS. The fastest and highest performance PCIe NVMe SSD available in the market today. Offered in 3.2TB and 6.4TB user capacities, Data Engine T2HP is in a class of its own, surpassing 1.7 million random IOPS and 6.8GB/s in bandwidth per SSD. Lowest $/IOPS total cost of ownership with unmatched QoS and bandwidth. It features an unprecedented 600K random sustained write IOPSoffering the best mix of random read and write performance and low latency. It is an enterprise quality drive that is engineered to perform as a reliable workhorse in High Performance Computing (HPC) environment. The Data Engine T2HP SSD is truly unique. Smart IOPS has combined the superior performance that it has come to be known for with best-in-class NAND technology to rival the latest non-volatile memory products offered by others. However, unlike those products that require forklift server upgrade, Data Engine T2LL offers QoS latency and response time that is on par and at a small fraction of the cost of those new trendy non-volatile memory solutions. Moreover, Data Engine T2LL offers random and sequential Read/Write performance that is orders of magnitude greater than those caching non-volatile memory products. Eliminate application bottlenecks without the exorbitant cost and trouble. One of the largest user capacity in a half height half length (HHHL) add-in card form factor with up to 25.6TB. Unlike other larger SSDs, the performance of Data Engine T2HC continues to far exceed any other SSD in its general class. Suitable for applications where a mix of performance and capacity is needed like big-data analytics, genomics, high speed data-acquisition. Offering the best combination of performance and cost. Optimized for reliability, capacity, and performance to enable the enterprise for its Digital Transformation. 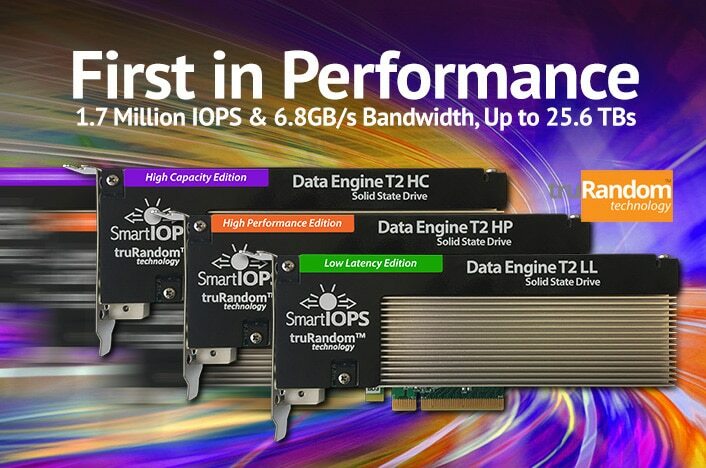 Smart IOPS is an innovation leader in storage solutions whose TruRandom™ technology creates new possibilities for flash technology to have a profound impact on current and next generation data center applications. Powered by TruRandom™, Smart IOPS SSDs substantially increase IOPS and bandwidth to remove the I/O storage bottleneck that severely limits the modern data center. Smart IOPS’ flash storage solutions enable Cloud Service Providers (CSP), High-Performance Computing and enterprise data centers to confidently deploy I/O intensive applications with greater reliability and SLA, at a fraction of the cost of other flash-based storage products. The perfect solution for OLTP, Big Data analytics, Database Mining, Data Warehousing, High Transaction Trading or Life Science, HPC, Virtual Desktop Infrastructure, Email as a Service, OLAP, Scale-out Storage and Cloud Service Provider environments.